I used a Sony Mavica CD1000 (with the little built-in CDROM drive) for almost five years, and loved it for its long zoom, its terrific steadyshot image stabilization, and its relatively light weight. Then I took a detour into Canon S1IS and S2IS, and liked them, but now I'm back, with the Sony H7. In May 2007 I shot almost 200 candid photos of an indoor commencement event, some in quite challenging lighting, without using flash at all. For the most part, I set the camera on the "use high ISO" setting and used the automatic exposure setting, with good results. The camera is capable of ISO 3200, but the high ISO setting seems to settle for 1600. The 15x zoom range is obviously a wonderful thing, and the steadyshot is good as ever. Some people will be put off by the somewhat plasticky feel of the H7, compared to the S2IS, but others will be happy because of the resulting light weight. The H7 also gives up the convenience of AA batteries, of which the H2 only needed two where the Canons take four, for a proprietary battery. If you ever go out and shoot all day long, hundreds of shots, you'll need to budget for an extra battery. The other treat that comes in the H7 box is a remote control: No more running back and forth to set the timer -- now you can compose the shot with the camera on the tripod and WALK rather than run to join the other subjects. The H7 seems to have crept onto the market quietly -- some outlets are still selling H2s for very little less than the H7. You can argue whether the H9 is worth the money, but the H7 is a good deal, with ISO 3200, 15x optical zoom, and 8 megapixels as its headline numbers. If you are shopping for a camera but not necessarily a NEW camera, the H7 will push down prices for well-kept H2s and Canon S2ISs so that you can get a lot of camera for an extremely reasonable price. Below are some comparison shots of the new Sony H7 camera next to its predecessor, the H2. For some examples of photos taken with the H7, see http://flickr.com/photos/farsightful/sets/72157600244333400/. In this view you can see that the H7 carries a little more glass than the H2. The zoom range of the H7 is 15:1, that of the H2 "only" 12:1. The H7 is actually a little more compact than the H2, because the viewfinder doesn't protrude so much. This can make a difference in how you carry the camera; the H2 for instance is just a little too deep and irregular in shape to fit the Lowepro Z30, which is a nice tight fit for the Canon S2IS and now for the H7. The H7 doesn't have the largest available LCD screen on the market, but it is clearly a good deal larger than the one on the H2. 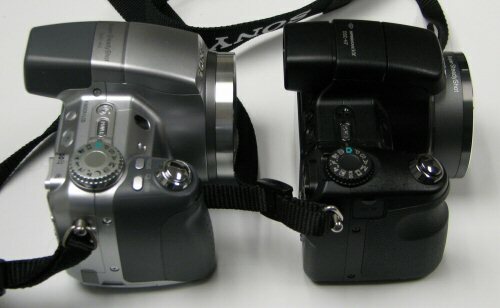 The circular wheel around the four-way selector on the right hand side of the H7 is the jog wheel, replacing the wheel at the right-hand index finger (in front of the shutter button) on the H2.